As a homeowner, it is important to keep your home maintained. Not doing so can result in costly repairs that may have been avoided. Hiring a professional to perform an inspection can help you avoid extensive damages. One of the most common problems homeowners tend to have is a leaky roof. Unfortunately, once your roof begins to leak, pinpointing the source can be a challenge. Once the water has made its way into your home, chances are it has been leaking for a while, may have caused damage to other areas. Leaky roofs are very common for Michigan homeowners during the winter time. You may need roof or shingle repair, however, it will save you from a costly ceiling repair or other home water damage repairs. Winter time in Michigan comes with a lot of standing water and extra weight upon our roofs. Snow or ice accumulation can cause severe damage to roofs that have pre-existing problems. Majority of roof damage leads to expensive leaks once snow and ice begin to thaw. To prevent expensive damage, be sure to schedule a professional pre-winter roof inspection. By doing so, professional roofers at Eastbrook Construction can point out any damages that may become a larger problem throughout the winter. Because there is still time before the snow begins to fall, you can even schedule your roofing repairs in Michigan, to ensure you and your family stay dry this winter. If your roof does begin to leak during the winter time in Michigan it is important to find the source of the leak as soon as possible. Typically by the time that you begin to notice water leaking into your home, chances are the leak has been there for a while. 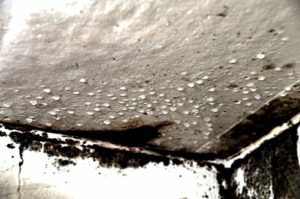 Water begins to seep into your home through your roof, traveling down the rafters, soaking into your drywall or plaster ceiling, before it finally begins to drip. This can lead to your ceiling caving in, mold, or expensive damage to your roofing structure. The best way to avoid costly roofing damages is to schedule your pre-winter roof inspection today. Our professional roofers at Eastbrook Construction can perform roofing services in Michigan to make sure your roof is in tip-top shape for winter! This entry was posted in Roof Inspections, Roof repair, Roofing Company, Roofing Contractor and tagged pre-winter roof inspection, prevent ceiling water damage, preventing roof leaks, professional roofers Michigan, repair roof leaks, roofing services in Michigan. Bookmark the permalink.